Celtic Timber has the largest stock and selection of new and used wooden oak barrels in UK and probably Europe including different types of wine barrels, whiskey barrels, sherry barrels, and beer barrels in a range of sizes from 1 litre up to 500 litres. Due to the differences between these barrels, it is worth considering which barrel will be more suitable for your intended use. Unlike our oak wine barrels, the used whiskey barrels and sherry barrels that we sell are available in a variety of shapes, appearance and sizes from 200 litres up to 500 litres. Often referred to as wooden beer barrels or beer kegs, these barrels are up to 30 years old and some have been used up to 10 times for different brews. In appearance, they are dark brown in colour and normally have steel/iron bands. These barrels are sourced from various distilleries around the world where they are freshly emptied before being delivered to us. 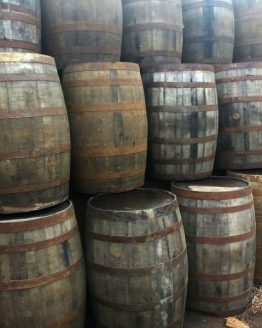 It is not uncommon to find a dram of whiskey or sherry still left in the barrels which helps keep the barrels moist inside before they are sealed back up with the bung. Generally, the barrels are watertight unless stated in the item description which makes them very popular with craft brewers of beers, ciders, and spirits. Due to their size and shape, when cut in half, these make for ideal oak barrel planters for planting flowers, trees, herbs and even vegetables. They can also be used for water features and water butts and in the retail sector are quite often used for displays in supermarkets, restaurants, shops and delis as half barrel planters or as oak barrel tables, and stools. Whiskey and Sherry barrels make very authentic looking tables and even bars when the oak barrels are cut in half lengthways and stood upright giving the effect that the bar or counter is made out of a number of full used oak barrels. Whiskey barrels can also be refurbished on our in-house barrel sanding machine, providing an authentic, rustic look. A market that is growing increasingly in size is the use of used oak whiskey barrels or sherry barrels for cooking and smoking food as a fuel. We have been breaking down used barrels for years and using the staves (staves are the singular pieces of oak that are squeezed together to make a barrel) for furniture making however we now offer whiskey barrel and sherry barrel wood chips of various sizes which well-known chefs are using to flavour the food with the alcohol which is infused in the oak whilst it cooks or smokes. These can be bought in small or large amounts. Whiskey barrels are full to the brim of character and history. Sometimes they just look great sat outside a pub or bar. Occasionally, they have also been used as props in movies and TV shows. Since we were founded, we have sent hundreds of used oak whiskey barrels all over the world for TV and film props some including Pirates of the Caribbean; Salizar’s Revenge amongst others. Some other popular uses for these used oak whiskey barrels are for feature walls, flooring or cladding. 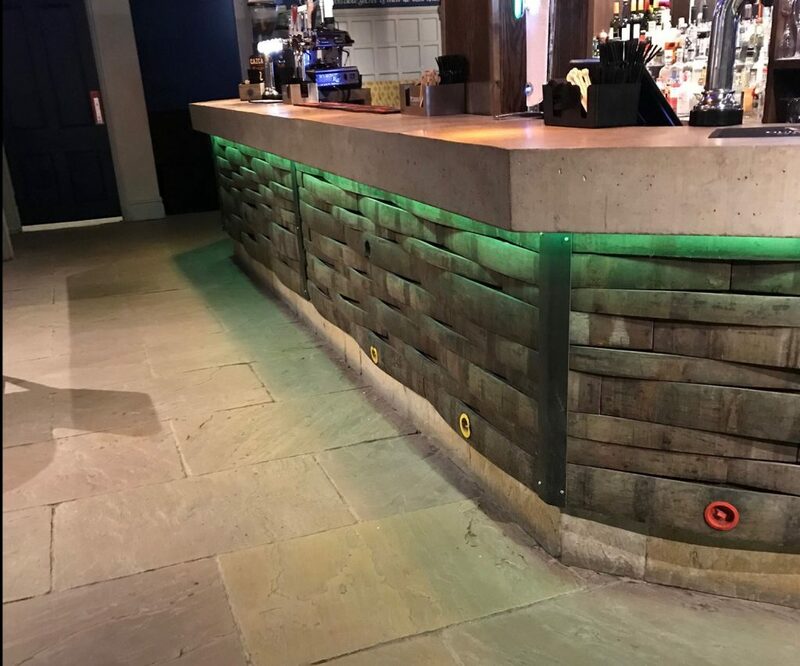 This is done by using the full-length staves of the barrels and joining them together on to a flat service, they can then either be left with an uneven finish or if sanded back enough can create a flat service for work surfaces, table tops and even flooring. ← What Size, Colour and Finish Oak Mantle Beam Should I Choose for my Mantelpiece?